A full clergy list is here. The diocese was founded in 1980. It covers the civil provinces of Niassa, Zambesia and Tete north of the River Zambesi. Bishop Mark Van Koevering was ordained Bishop in September 2003 and retired in October 2015. The cathedral church is St Bartholomew’s at Messumba on the Lakeshore. In 2007, rebuilding work started on the cathedral. (October 2007 Progress Report). 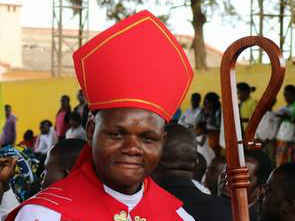 Bishop Vicente Msosa was consecrated Bishop on 25 February 2017 and enthroned as the fourth Bishop of Niassa on 1 April 2017. Previously he was Director of Evangelism for Youth Ministry in the Archdeaconry of Lichinga and Diocesan Co-ordinator of Ministry and Rooted in Jesus training for Catechists. Fr. Vicente Msosa was born on 18 February 1981 in Chuanga, 4Km from Messumba Cathedral. He was educated locally and after 12th grade went to Teacher Training College where he trained as a teacher. Whilst teaching he was much involved with evangelism. In 2010 he studied at the College of the Transfiguration where he obtained a Diploma of Theology. In 2013 he was ordained deacon and later in the year ordained priest. He then studied for a Degree in Theology at the Malawian Lake Anglican University and is currently studying for a Masters Degree in Ministry with the Minnesota School of Theology. He is married to Anastacia and they have three children - Andrason, Ebenezer and Omegarda. and reports of visits between linked parishes and schools.